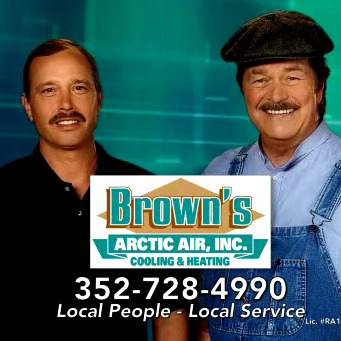 Robert Brown, of Brown's Arctic Air, Inc., represents the third generation of his family heading up his air conditioning and heating sales and service business. "I was taught by the best from right out of high school," Brown said. “My 'Papa' cut me no slack. I started out as a duct mechanic’s helper. I went to vocational tech school at night to learn the basics and attended the school of hard knocks during the day. From duct mechanic helper, I progressed to Job Foreman, running crews from two to four, then to Sales and Service Manager where I learned design and indoor air quality." Brown's Arctic Air takes its reputation seriously. "Quality and fairness is our backbone and second nature. Anything else is unacceptable," Brown said. "I was taught to inform the customer. My customers are intelligent people. I give them enough information to let them make the smart choice that fits their budget. My reputation is my most valuable advertising investment." Not surprisingly, Brown's advice to aspiring entrepreneurs follows that same thread. "Honesty and integrity, a good work ethic, lots of energy and good communication skills are all key elements for someone who is going to branch out on their own," he said. "Nothing happens overnight so dedication and focus are also very important. Set your goals and keep reaching for success."